The tortilla chip is a marvelous thing. It’s salty, crunchy, textured, and goes well with just about anything. 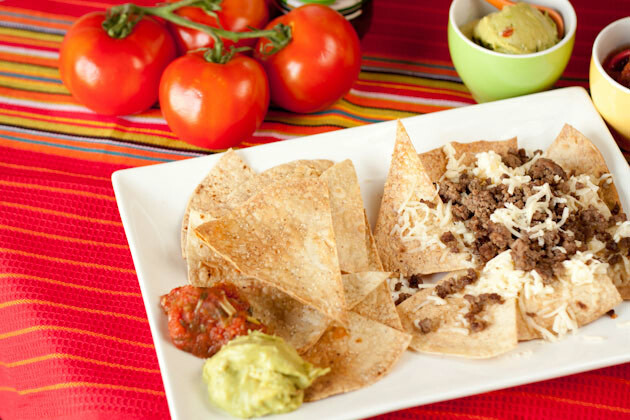 If you’re not down with corn, or you’re looking for a light summertime snack, the classic tortilla chip just doesn’t fit the bill. 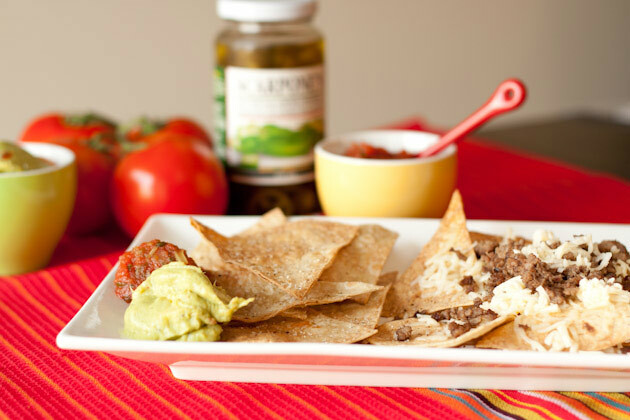 But do not fret, my new corn-free tortilla chip recipe has your name written all over it. 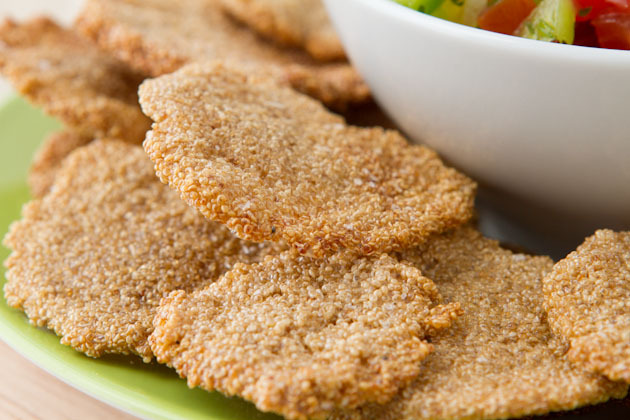 They are gluten-free, high in protein, high in fiber, and have absolutely NO corn or oil. I made the chips with something… interesting. It’s called amaranth. Have you heard of it? 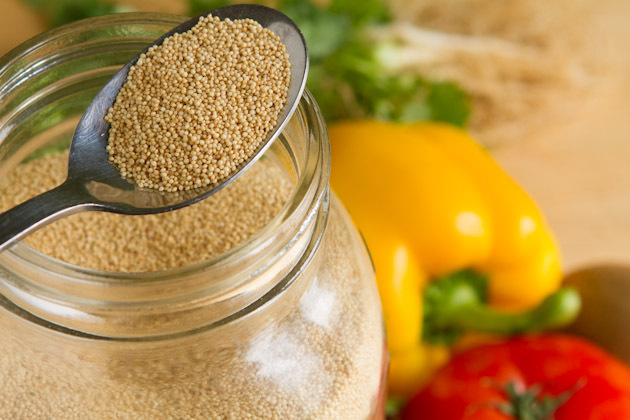 Amaranth is a gluten-free grain that’s loaded with protein, calcium, magnesium and iron. It can be popped like itty bits of popcorn and made into a high protein cereal, added to homemade granola bars, or; as I’ve just learned during a massive bout of experimenting, can be transformed into corn-free nachos. I purchase my amaranth from Upaya Naturals but you can get it from Amazon, iHerb or any health food store. 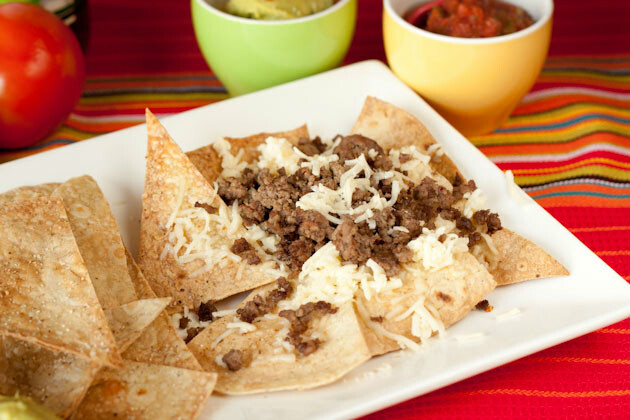 To view, print or email this recipe, click here. 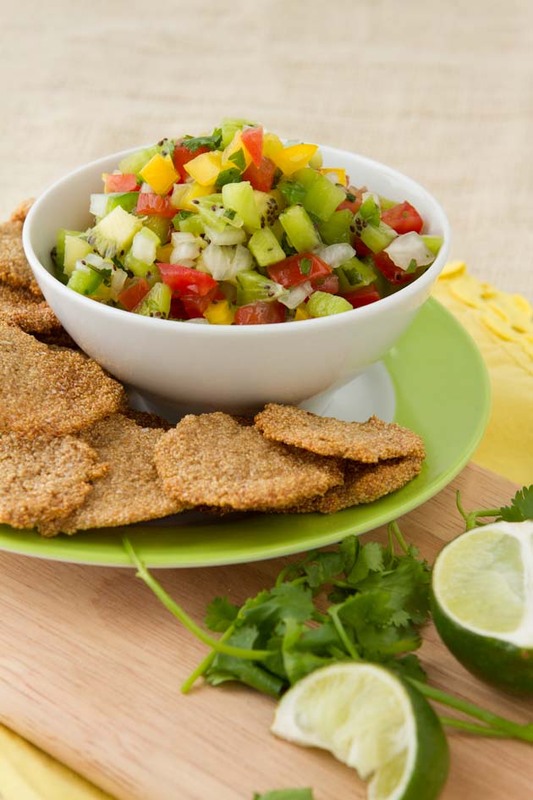 These corn-free chips with fresh, summer-inspired salsa makes for a healthy, feel-good snack. To make the chips, add amaranth and water to a small saucepan. Cover and bring to a boil. Reduce heat to low and simmer for 20-25 minutes until liquid is absorbed. Remove from heat, transfer cooked amaranth to a bowl and allow to chill for 30 minutes. Stir in salt and lime zest to the cooled cooked amaranth. Preheat oven to 350F and line a baking sheet with parchment paper or a silicon baking sheet. Scoop up cooked amaranth using a teaspoon and roll between hands to form a ball. Press into prepared baking sheet and flatten with fingers to form a circle. The amaranth will be very sticky, just try your best to flatten to ⅛-inch or so. Repeat with remaining amaranth. Bake in the oven for 15 minutes, remove, rotate and bake for another 10 minutes, until crisp. Meanwhile, combine salsa ingredients in a medium bowl. Cover and refrigerate until chips are ready to eat! 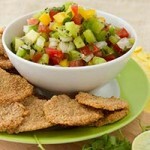 To make the chips, add amaranth and water to a small saucepan. Cover and bring to a boil. Reduce heat to low and simmer for 20-25 minutes until liquid is absorbed. Remove from heat, transfer cooked amaranth to a bowl and allow to chill for 30 minutes. Preheat oven to 350F and line a baking sheet with parchment paper or a silicon baking sheet. Scoop up cooked amaranth using a teaspoon and roll between hands to form a ball. Press into prepared baking sheet and flatten with fingers to form a circle. The amaranth will be very sticky, just try your best to flatten to 1/8-inch or so. Repeat with remaining amaranth. Bake in the oven for 15 minutes, remove, rotate and bake for another 10 minutes, until crisp. Remove from the oven and allow to cool for 20 minutes. Angela and I made these chips when she came for a visit last month and were blown away with just how freakin’ delicious they were. No oil, no corn, crunchy, salty, snacky. 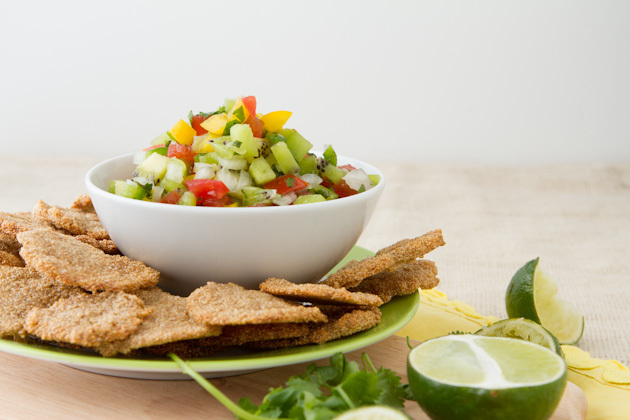 Summer-time snacks… what are your favorites?